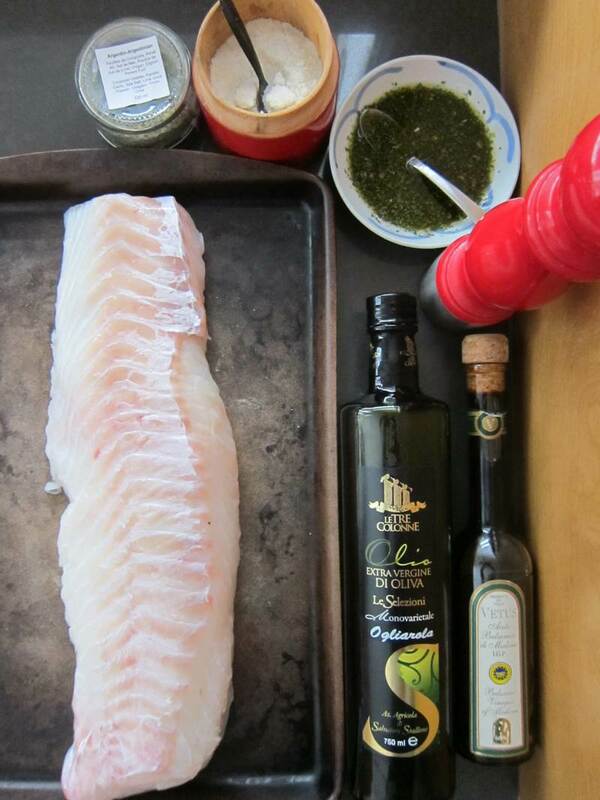 It took just a few minutes to select the wild cod at La Poissonnerie Du Marché Atwater, no time at all to whisk it into the oven and seconds to make the Chimichurri in a Hurry. That’s what I call a main dish with slow-cooked taste and fast food timing. Preheat oven to 420F. Coat the fish in a little olive oil and sprinkle on garlic powder, salt and pepper. Roast the fish on a medium-sized baking pan for 18 minutes. It will flake and turn opaque when done. Slice the fish into 6-8 portions. Spoon the Chimichurri sauce over each portion after plating. Whip up another batch of Chimichurri sauce if you need more. It also makes a spectacular bread dipping sauce. 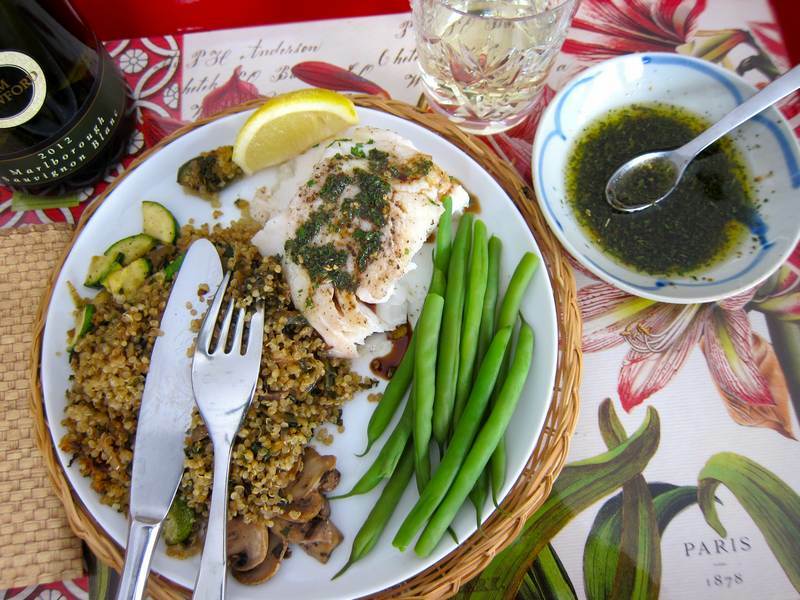 Served here with green beans and quinoa dressed with caramelized onion, mushrooms, zucchini and very finely chopped kale. Quinoa can be cooked in advance and re-heated in the oven, first without, then with a cover for a nice crunchy texture. Have lots of time on your hands and want to make Chimichurri from scratch? Have enough time to gaze upon 75 pictures of the year 2013? Have very little time on your hands and looking for 5 Simple Steps to a Better 2014? This looks delicious. I thought all cod was wild or ocean caught. Is cod also farm raised? I have not seen anything but regular ocean caught cod. I’m the jittery one. I just write what the fish monger tells me. And I guess wild sounds good. Didn’t mean to stump you. I thought maybe I didn’t know about the types of cod. Thanks for the recipe. I definitely want to make it. No worries. It’s a learning opportunity. I’m always curious. Fish provenance is complicated these days. GREAT! I love cod and chimichurri. And you’ll love the speed of preparing this! Perfect for dinner parties. At the bottom of the post I think. Thanks for asking.